Go to WP Admin > Plugins and install the Ninja Forms. Visit WP Admin > Ninja Forms > System status / Get Help and check if you don't have an outdated PHP version. WordPress recommend 7 or greater. If you have such outdated version, please contact your hosting provider and ask for a PHP update. It will improve the server speed and security. Check with your hosting provider if there is no security restriction regarding the connections to the third-party servers. Please ask them to whitelist our server seowptheme.com. If you are using the HostGator hosting company, please note they by default block all the outgoing connections on the client's websites. Because of this restriction, our theme can’t download all the images from the demo website. Before installing our theme, please contact HostGator support directly with a request to whitelist the Mod_Sec rule 1234234. 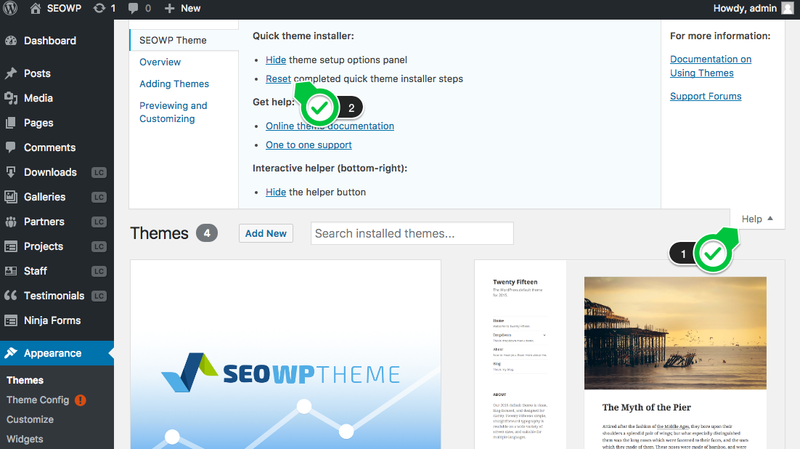 After that, the theme installer and the demo content importer will be fully functional on your website. The error log should provide enough information about the cause. Sometimes, this error log can be empty. Most likely, this is happening because you are trying to upload English content over a different WordPress language installation. Please go to WP Admin > Settings > General and set the installation language on "English". After the demo import, you can switch the language to the initial one. This notice is related to a server security restriction or, to a server feature which may be disabled (cURL for instance). You can use this panel to reset the demo import feature and start it again. However, the better way is to reset the WordPress to an initial state and install the content again. Please note a reset will delete all your content. All the theme plugins are delivered in the downloaded package / Premium Plugins folder.